The Department of Health and Human Services reportedly will visit military bases to see if they'd be appropriate places to house immigrant children. The Department of Health and Human Services is reportedly looking into using military bases to house immigrant children separated from their parents after crossing the U.S.-Mexico border illegally. HHS officials will reportedly visit four bases in Texas and Arkansas to see if they would be good places to house the children. HHS hasn't officially asked the Pentagon to allow unaccompanied minors to be housed on its bases yet. President Donald Trump's administration announced earlier this month it'd be prosecuting all illegal border crossings, including adults who cross into the U.S. with children. 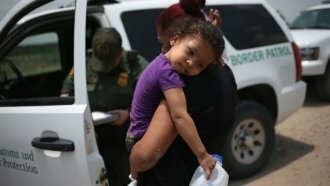 Related Story Separating Families Caught At The Border: Rhetoric Or Real Policy? The prosecutions will be handled by the Department of Homeland Security, but children separated from their parents would go to HHS holding facilities. The Washington Post reports that existing facilities are already at 91 percent capacity and that additional prosecutions and separations could push them beyond their limits. Housing immigrant children at military bases has been done before. In 2014, the Obama administration did so to deal with a spike in unaccompanied minors crossing into the U.S.